Seven years ago, the Veil that separates humanity from what lies beyond was torn apart, and New Orleans was engulfed in a supernatural war. Now, those with paranormal powers have been confined in a walled community that humans call the District. Those who live there call it Devil's Isle. 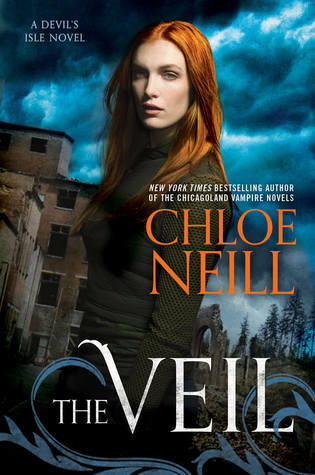 I am such a huge Chloe Neill fan so I was super excited when I found out she was writing a new UF series; The Veil is the first book in the Devil’s Isle series. This book started off slowly for me, there was a lot of information to take in and I must admit I almost gave up and started on something else but I am really pleased that I persisted because it ended up being creative an unique with a great cast of well-written characters and an interesting premise. Our MC is Claire Connolly, she runs a store in NOLA and lives with a dangerous secret: she’s what is known as a Sensitive, a human gifted with magic. The Veil is like a magical barrier that separates the human and the paranormal worlds. Claire knows that revealing her ability would mean being sent off to Devil’s Isle so she needs to learn how to control it before she is found out. The world-building is developed extremely well and we are given detailed history about what had happened for things to now be as they are. The Veil that separates humans from the supernatural that lie beyond was torn apart which led to war; now anyone with magical powers are confined in a enclosed community that humans call the District but is otherwise known as Devil’s Isle; the magical aspect was also explained well and was quite imaginative. As I mentioned the pacing at the beginning was extremely slow for me but it did pick up and became quite exciting; the plot was interesting and quite action-packed and intense; I am excited to see how it all progresses in the next book. I found all of the characters to be likeable, Claire was kind-hearted, intelligent, resilient and fiercely independent, having recently lost her father she was more or less alone except for her close friends Gunnar and Tadji; we are also introduced to the mysterious and smexy Liam Quinn, a bounty hunter who had me questioning his loyalty throughout so I can’t wait to see how their relationship progresses; we get some strong chemistry but it doesn’t progress much to my disappointment. We are also introduced to the perfect villain, one I couldn’t help but despise. Chloe Neill’s writing is wonderfully engaging and the world and NOLA setting that we are introduced to was mesmerising. With a fabulous cast of characters, world-building that goes above and beyond and unique magical aspect I am more than eager to read the next book in the Devil’s Isle series. Overall, The Veil is filled with intense moments, a surprise betrayal, diverse paranormal beings and a satisfying conclusion. It is certainly different to Neill's Chicagoland Vampire series which I appreciated. About the author: Chloe Neill is the New York Times bestselling author of the Chicagoland Vampires Novels, the Devil's Isle Novels, and a YA series, the Dark Elite. Chloe was born and raised in the South, but now makes her home in the Midwest. When she's not writing, she bakes, works, and scours the Internet for good recipes and great graphic design. Chloe also maintains her sanity by spending time with her boys--her husband and their dogs, Baxter and Scout. I almost gave up but I'm so glad I persisted :-) I would love a bit more from the romance. I liked this book, gave it a 4 stars. The only things I disliked, there wasn't much in the way of romance. Also, it was mainly just an info dump to set up the series. Great review! Yes, I agree! I would love more from the romance - hopefully now that the world-building has been formed there will be less info dumping in the next book. I really slipped right into this one, but I am glad it picked up for you and that you enjoyed it. I am excited to continue. Super excited for the next book Kimba! such a shame there is such a wait..